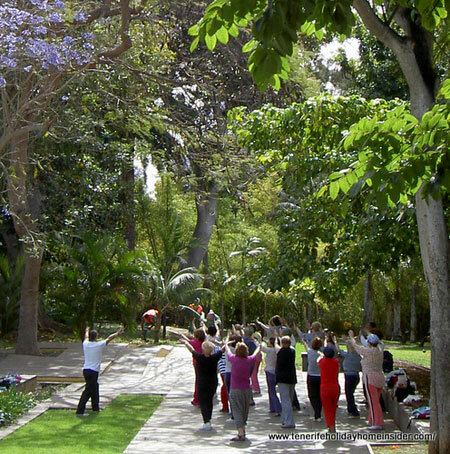 Living in Tenerife is one of the best options for retirement, as the aerobics photo of Parque Sanabria confirms. Pin-it is in the top left corner for your Pinterest copies. The weather of the Tenerife island of eternal spring is almost always like in that picture. We all know, what that means for our well being and happiness. The healthy Tenerife climatic conditions are ideal for the elderly, who often suffer of rheumatism, asthma, arthritis and pulmonary problems. The biggest Canary Island with its different climate zones lets you pick the region where to live, which is best for you.. For me and many of my friends, who are not so young either, the North of the island is best. It is generally two degrees Celsius cooler than in the south. Let's not argue, however... Some, never find it hot enough, our old dog does. Even living in Tenerife for some months of the year can save a marriage. Note that great, true story when you scroll down. It's about the foreign semi expat with Alzheimer's. He and his charming wife were received with warm welcome by a Spanish Puerto Cruz Day Center where much fun is to be had by all sorts of events. What is most important when we get older? Health, food and fun must be what count most. Local agriculture gives you fresh vegetables and fruit with many subtropical varieties like oranges, lemons, mangos and the papaya which is rich in vitamin A. Fresh fish is caught by the island's own fisheries. Wine is grown and sold for every budget. Often it doesn't cost you more than a glass of mineral water. towns and cater for special diets for all who are living in Tenerife. 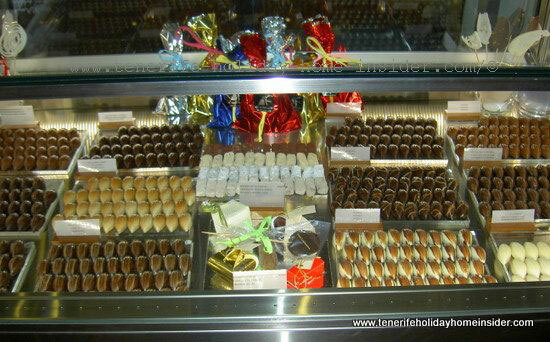 Get some El Aderno chocolates and sweets for diabetics or the weight conscious here or phone them in Puerto de la Cruz La Paz, Buenavista del Norte as well as in the capital Santa Cruz. This tax is called I.G.I.C in Tenerife and is 6,5% again in 2019. The same tax is called IVA on mainland Spain and is 21%. Therefore, it's much cheaper to buy new property or land on the Canary Islands, to give only one example. with minimal taxes of about 1%. I would like to mention that I recently declared income tax and had a tax exemption (tax free up to) of about €9700/for year 2008. 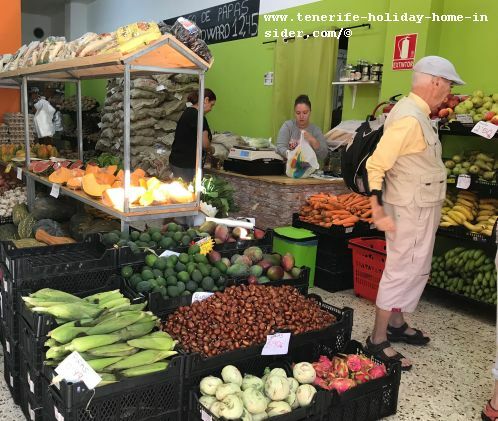 No doubt the best time to shop when you live in Tenerife are when seasonal sales (Ofertas) are on. Go early and find most fantastic bargains at all malls. Above all C&A for bigger sizes and mind all the Indesit group outlets like Masimo Dusi, Bershka, Zara and you name it. Petrol (called Gaz in USA) has always been a very cheap factor of living in Tenerife. It is now in the region of €1,10 in 2013 but goes up and down a little. Car insurances are not so cheap, though, but cheaper than in most European countries. You can have a very good value for money hospital insurance by DKV (seguro de salud) in Spain for as little as € 53 a month (in 2013) even when you are 65 years old already. Of course, doctor visits for preventing and general check-ups are not covered. That's the least expense. Isn't it? (Will be updated, as soon as possible) The following prices have gone up a bit by 2013, but not much. I will keep you posted, as soon as possible. A lattice 0,15 Cents (before Christmas) that was really special. 1 liter bottle sunflower oil = € 0,99 (at Mercadona Puerto de la Cruz supermarket). By the way, most foodstuff has gone up by almost 5% since 2008, while value added tax of 5%, which is included in above prices, is as low as before. I simply picked some articles where I found 1 item or a kg price in my last shopping list. I pay EU 3,25 = GBP 2,48 take away food for a portion of noodles with chicken and vegetables at my Chinese shop where I live. The portion is quite generous and will feed a man if he gets some bread also. Always look out for farmer shops, such as the Tienda Agrokinesis in the open commercial Zone of Longuera of Realejos or its shop El Agricultor the farmer where bananas cost Euro 0,65 in February 2019 with many other options for cheap, but fresh produce. It's prices are fluctuating depending on seasons and the farmers that supply directly. The many Tenerife eating places are cheap compared to those in Northern Europe. Entertainment on the biggest Canary Island is often for free. 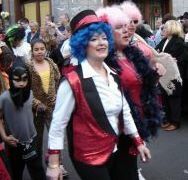 Tenerife carnival, which is not only thought after by the large Tenerife gay community is, of course, tops for all who retire on the island. The people in my Carnival picture above might be on retirement and living in Tenerife. Often, such people like Julia from the UK stay on after holidays on the island. 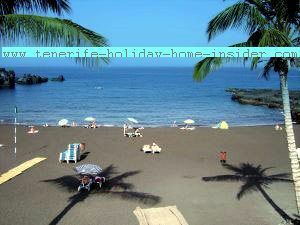 Many relax by Tenerife seashores such as the Tenerife beach by Los Gigantes. You know that ocean water and air are not only good for skin and eyes, but for your whole body. Some retirees, I know, had operations in Tenerife. They were refunded by their overseas health care. Most of them had successful Tenerife medical care. Now, all you need is the European blue card to profit by local health care. 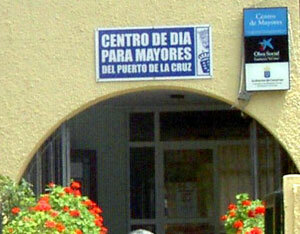 Spanish public health centers are not only in all towns, but often in every suburb. How much medicine is paid by local health services? A friend of mine just told me she has to pay about 40% of expensive medicine out of her own pocket, the rest is paid thanks to her blue card. This applies above all to expensive, prescribed high blood pressure medicine, which she needs, she said. Please, find out from your overseas medical aid organization or social security, how to go about getting the blue card which entitles you fully to European sharing of health care. You can even use it while on a short holiday, if need be. We call the Tenerife European resident document the green one for most of its color. Once, you are living in Tenerife more than 3 months, you should apply for it at your local police station. You need to bring a document which states that you live in Tenerife which is called documento de empadronamiento. You get that at your local town hall. For example, use Europe's resident permit together with your passport including a photo copy of it to travel from Los Christianos for €18 to La Gomera by ferry. I consider this price to travel to the neighboring island as dirt cheap. Before, a proper "Residencia permit" was required to enjoy to live in Tenerife. The Residencia, also often called Tajeta de Residencia (residence card) is a hassle and also costly to get. However, the 'green document' also obliges you to declare income tax. If you don't have earnings, you will not get any written order from the Tenerife "Receiver of revenue" called Hacienda to declare any. This means 'playing with fire', which could make you a tax dodger. The other day I stumbled upon a German friend called Barbara. She spends all winters in Tenerife together with her sweet husband who has Alzheimer's disease. We used to meet at a Cultural reunion in La Paz but, that is closed now. Moving your account from a Tenerife bank to another one is easy while living in Tenerife. However, it usually means almost endless problems if you had stop orders in the financial institution which you left. It can take more than half a year until all your stop orders work again, never mind being able to close the previous account. If you close it too early it could mean your vital supplies like electricity could be cut without warning. Pensioners fancy walking very much, while living in Tenerife. Even Tenerife towns lend themselves well to it. Not all parts, though, if you have mobility problems. Often roads are steep. 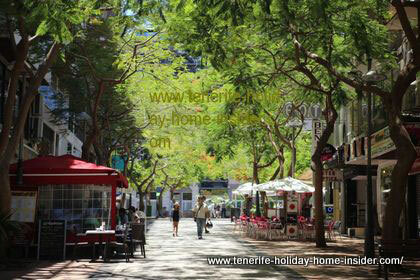 Here, you see a street scene in Tenerife north, Puerto Cruz, the oldest Tenerife resort. Clubs for everything are to be found for those who are living in Tenerife. Some are for sports, others for games like bingo and other types of socializing. You name it, you'll find it. Tanssisaluuna is a Finnish club in North Tenerife, which caters not only for Scandinavians but, welcomes all who are not so young. It's in the oldest Tenerife resort Puerto Cruz to the left opposite the bus station. Total inhabitants living in Tenerife have shrunk to 898680, as many of the unemployed left the island. I saw the following a while ago in the German Tenerife newspaper Wochenspiegel: 450000 out of this figure are analphabets and still sign with a cross. Why so many? School attendance for Spanish children has only become obligation since General Franco's death after 1975. Lately, even foreigners from as far as Finland, Ukraine and Russia have opted for living in Tenerife and still do so, also, at advanced age. Why do so many come to live in Tenerife? There are always frequent affordable Tenerife flights, for the home sick on retirement to escape. Most of the singles who are living in Tenerife on their own say that they could never cook that cheap and good. This includes young people as well. with her work as Webmaster. near El Sauzal as a pensioner and organizes Solstice parties on his grounds above the sea twice a year. 2 successful Cataract and other operations in Tenerife North. The list could go on for ever. In the context of health find information about a Dr.Theis a respected English speaking Doctor in Tenerife. 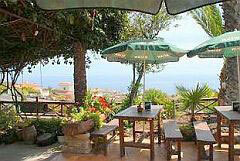 There are several places that cater for the elderly who prefer living in Tenerife to any other country. But why use up all your finances? It's still possible to live wisely and very well in Tenerife. Get your own place in a safe environment which is comfortable, easy and practical to maintain. Find the perfect choice by a cozy apartment by Puerto Cruz. By the way, the best investment in Tenerife is not only property investment but, in its healthy life style by living there. Check out attractive Tenerife to spice up your life on the island. Health in Tenerife which is not always guarantied to care for. From living in Tenerife back to retirement advice which is a comprehensive, practical guide with additional links to expat stories..